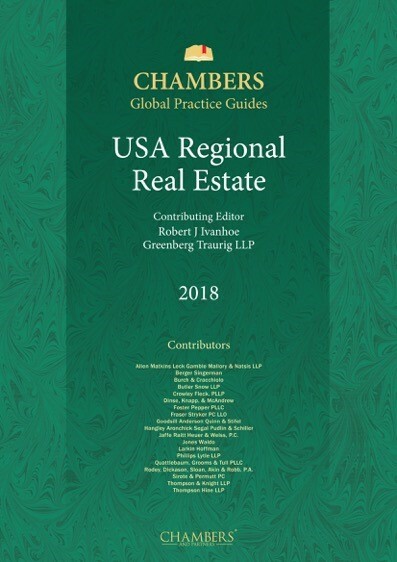 The USA: Regional Real Estate guide provides expert legal commentary on the key issues for businesses involved in the real estate sector. The guide covers the important developments in the most significant jurisdictions. Greenberg Traurig, LLP Real Estate Practice is a cornerstone of the firm and recognized leader in the industry. The firm’s real estate attorneys deliver diversified and comprehensive counsel for property acquisition and investment, development, management and leasing, financing, restructuring, and disposition of all asset classes of real estate. The team draws upon the knowledge and experience of more than 400 real estate lawyers from around the world, serving clients from key markets in the United States, Europe, the Middle East, and Latin America. The group’s clientele includes a broad range of property developers, lenders, investment managers, private equity funds, REITs, and private owners. The firm’s real estate team advises clients on a variety of matters across a broad spectrum of commercial, recreational, and residential real estate, including structured equity and debt and the hybrids. Notwithstanding tumultuous domestic and international political conditions, the U.S. economy has grown steadily over the past 12 months. The Dow Jones Industrial Average reached record highs, the U.S. Unemployment Rate achieved historic lows and consumer confidence is the strongest it has been in nearly two decades. Despite strong underlying fundamentals that have historically benefited the retail sector, that industry has struggled – 2017 was marred with record store closures and bankruptcy filings. Foreign investments into retail have fallen dramatically. Although the office sector has seen a decline in transactions, foreign investment in this area continues to remain strong. In an effort to reverse these current downward trends, owners of retail and office properties have started to rethink the ways in which they attract consumers. Many retail and office spaces are beginning to provide access to a wide variety of amenities and “full service” hospitality-like facilities. Airport operators are already integrating such services into their business models. Over the next decade, operators intend to invest tens of billions of dollars in America’s airports to make them more attractive to travelers, utilizing both traditional financing approaches and public-private partnerships to raise capital. These exciting changes in the retail, office and airport sectors will likely spur long-term growth and reverse the recent cycle of decline in these areas. Retail store closures have accelerated to a record pace. Store closure announcements have increased more than 200 percent in the last year alone. Walgreens, for example, recently announced that it would close roughly 600 locations across the country. J.Crew is suffering a similar fate. The retailer is shutting down more than twice the number of locations than initially planned for this year. To reverse this trend, landlords and tenants alike are looking for new ways to drive consumers back into the traditional brick-and-mortar establishments which have lost consumers to the exponential growth of the e-commerce marketplace. Accordingly, we will see an increase in the amount of collaboration among landlords and their retail tenants in 2018. CBRE reports that “[w]e expect to see new and prominent examples of this partnership trend [in 2018], with landlords investing more in new retail concepts through incubator initiatives. Data sharing between retail tenants and landlords – especially in the mall segments – in key areas like traffic and sales will increase, as both sides seek to improve revenue and marketing effectiveness.” Over the next year, we will certainly see a rise in new, unique retail concepts and other attractions designed to increase traffic in brick-and-mortar locations. Nordstrom, Inc. is the most recent company to invest in such new retail concepts. Nordstrom recently opened a 47,000-square-foot men’s store at 235 West 57th Street in Manhattan, near Columbus Circle. The location made history for the company which started as a shoe store in 1901 – the men’s store is Nordstrom’s first full-line men’s store and first store in Manhattan. The store also provides unique services that are designed to make the consumer shopping experience more gratifying. For example, Nordstrom offers custom tailoring services, “Express Returns” kiosks and a “Clubhouse” serving handcrafted cocktails and local and international beers and wines. The store even offers an after-hours pick-up service, where customers can retrieve online orders 24 hours a day, seven days a week. Nordstrom and other retailers are hoping that new stores like this, with a focus on hospitality and the consumer experience, will fortify their customer base and drive profitability in the future. The strong economy has been a catalyst for office job growth. PwC and the Urban Land Institute report that “[o]ffice job growth is strong – expanding by 2.2 percent on average in this recovery as compared with 1.6 percent total job growth. In a race for talent, office space is now a key tool for tenants to attract and retain employees.” Accordingly, tenants are seeking new, innovative office spaces to conduct their business. Landlords acknowledge the need for such spaces, and are beginning to offer amenities which “include finishes that rival those seen in hotel lobbies, large public spaces to relax and plug in, multiple food options, high-end fitness facilities, event space, roof decks, and outdoor spaces.” It is likely that older buildings will struggle in this regard, given the difficulty and cost to retrofit existing spaces to incorporate these amenities. Owners of new buildings, however, are designing their spaces around such amenities, making them focal points of their new properties. SL Green Realty Corp., for example, is in the process of constructing a 1.7-million-square-foot office tower in the heart of midtown Manhattan. “One Vanderbilt” will offer a Daniel Boulud restaurant and a 30,000-square-foot, tenant-only amenity floor which includes a conference center and a hospitality oriented/hotel lounge environment with soft seating indoors plus a 5,000-square-foot terrace overlooking Grand Central Terminal. “110 North Wacker Drive,” developed by the Howard Hughes Corporation and Riverside Investment & Development, will offer similar facilities. Located along the Chicago River, this building will offer amenities such as a roof deck, fitness center, dining options and a conference center. These amenities will be sure to attract new tenants and spearhead renewed growth in this sector. It is highly likely that we will see more developers incorporating such facilities into their projects in the coming years. Foreign investment in the retail sector has significantly decreased over the past 12 months. Off-shore investments in retail have fallen by 56.7 percent, stemming from fears that the industry will continue to struggle in the coming years. Most of the foreign capital in this area came from Canada and Germany, totaling roughly USD700 million in 2017. Despite the dramatic decrease in foreign retail investments, off-shore investments in the office sector have remained strong. Eighty-one and a half percent of all off-shore investments in 2017 came from Canada, China, Germany, Japan, Singapore and South Korea. Foreign investment into office assets will likely remain strong in the coming years. Over the next decade, operators plan on investing tens of billions of dollars in America’s airports. Los Angeles International Airport alone will receive almost USD10 billion in renovation funding in the next 10 years. Major projects are already underway, which include renovations to airfields, parking garages and shuttle trains. More significant, however, are the renovations to the terminals and concourses which house restaurants, retailers and other businesses. Amenities such as spas and ultra-luxury lounges, as well as restaurants featuring celebrity chefs and local farm-to-table food offerings, are being incorporated into the footprint of new airport terminals across the country to enhance the traveler experience. LaGuardia Airport, for example, is in the process of a multi-billion-dollar overhaul. Over USD4 billion of capital was raised for the project through a public-private partnership, the largest of its kind in the U.S. aviation industry; USD2.5 billion was raised in project bonds, USD1.5 billion was provided by the Port Authority of New York & New Jersey, the quasi-governmental body having jurisdiction over the airport, and USD200 million was raised by the shareholders of the project’s operator. The goal is to create a state-of-the-art terminal offering the latest in technology, hospitality services and food offerings. Airport operators such as those at LaGuardia are betting that new amenities and hospitality services will improve the traveler experience and drive revenues in the coming years. Despite the strong economy, the retail and office industries are in a state of decline. Retailers such as Nordstrom, whose shares have declined roughly 40 percent in the past three years, are beginning to offer innovative hospitality services aimed at drawing consumers back to traditional brick-and-mortar locations. Designers of office space are catering to tenants that increasingly demand new building amenities. America’s airports are investing billions of dollars in renovations to create state-of-the-art facilities which bring novel hospitality services to travelers. This new supply of hospitality offerings, aimed to attract consumers in an attempt to reverse the recent decline in these industries, will surely be a trend that we will continue to see in the coming years.